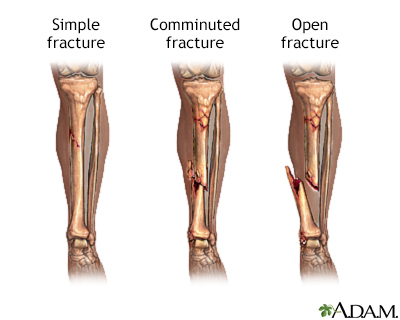 There are several types of bone fracture, including oblique -- a fracture which goes at an angle to the axis, comminuted -- a fracture of many relatively small fragments, spiral -- a fracture which runs around the axis of the bone, and compound -- a fracture (also called open) which breaks the skin. 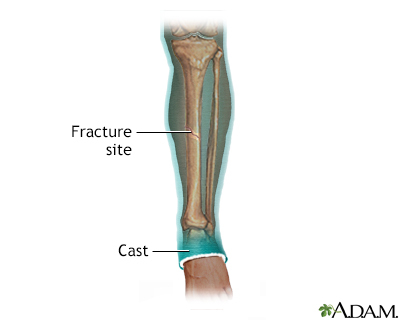 There are several types of bone fracture, including greenstick -- an incomplete fracture in which the bone bends, transverse -- a fracture that goes across the bones axis, and simple -- a fracture which does not break the skin. 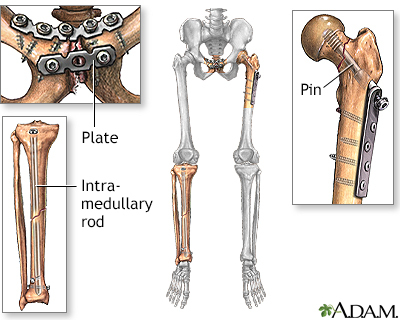 An internal fixation device may be used to keep fractured bones stabilized and in alignment. 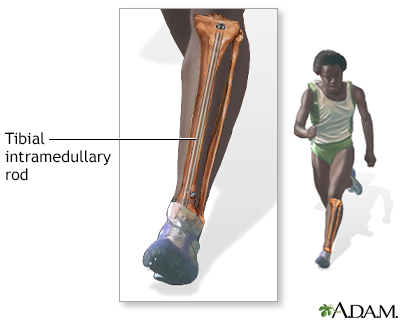 The device is inserted surgically to ensure the bones remain in an optimal position during and after the healing process.